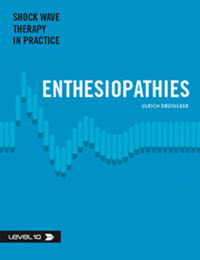 From the Level 10 series, Shock Wave Therapy in Practice: Enthesiopathies is a compilation of provocative insights from Orthopedic Specialist Ulrich Dreisilker and other esteemed medical experts. Physicians will gain a deep knowledge of the different treatment methods of Extracorporeal Shock Wave Therapy (ESWT) for patients with enthesiopathic conditions including how it's used in everyday practice. A brief history: How has ESWT evolved over the years? What are the physical characteristics of shock waves in medical practices today? How do theoretical models explain the effect of shock waves? What are the treatment considerations for enthesiopathic conditions? Shock Wave Therapy in Practice: Enthesiopathies can be special ordered now for $29 (+ shipping/handling). To request your copy, simply fill out the form to the right—we’ll be in touch quickly to process your order by phone.